So the damage calc has been outdated for some time (+VG, KT DL IS REV reworks) and guides on trovesaurus can go unmaintained so I thought I'd give recreating them a try in a format [.xls] that lets others potentially maintain it. I'm still working on it but here's what I've got so far (youtube.com), what other aspects might you want added? I'm thinking Beamer(s), Dragonling, maybe subclass abilities, VG/DL debuffs, some empowered gems. Good/Bad idea? Let me know. I would love to see an updated damage calculator. I’ve been hoping someone would recalculate the gem boost ratios, since the most up to date chart that I know of is from early this year, and we have had many new dragons and mastery levels since then which would affect this. Maybe something like like the damage calculator in SummerHaas’s spreadsheet but with the ability to select a class like the old damage calculator. I noticed what the issue is for the Top# and it'll be corrected once the general layout is finalized and brought over to the other classes. I think Est. DPS will work with some classes better than others. 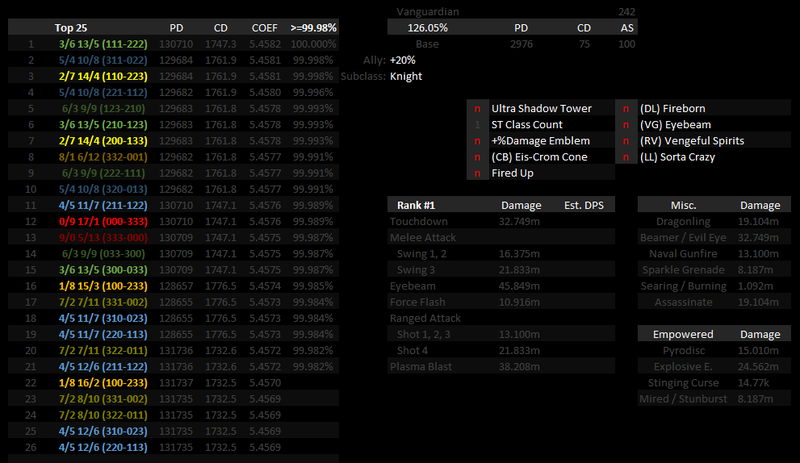 May stick with damage calculation for now and work on ideas for precise dps rotations later. Equipment tab (imgur.com) for those who didn't check the youtube link. Anything you feel I'm missing? where dmg is either pd or md, d is dmg from non-gems, c is cd from non-gems, and base is a scaled factor of dps. My tables use base / 10^8. The values are approximations to the actual values. For example, at least 0.1 md needs to be added to round to the actual md value for FT/GS/IS. For NN, I had to add at least 0.2 pd. For NN, I use base = dmg * (cd + 5000 / 107) because Heuristic Haxstar (shuriken) receives a 2.5 multiplier to CD at 3 charges, and I assume 3 normal attacks per shuriken. For now, I'll assume you can arrive at the same equation. Why don't you just use the Damage Coefficient Mod from The Symbols like everyone else? That mod doesn't tell you which gem boost layout to use, the other damage calc isnt updated, we could lose Arctech if they choose to play other games. I wanted to be self-reliant and prepared for geode phase 2. I learned Eyebeam doesn't buff Eyebeams damage. If you take the average % difference of all 190 combinations from the top 1 for GS, you should get almost 3%, which can be significant if you are speedrunning and hoping to go 3% faster. To be more realistic, I should account for probabilities of randomly getting a certain combination, which lowers the percentage to 0.66%. As expected, pr, strategy, and repetition have a greater influence on the outcome. Wouldn't have to be 5,320 combinations if they just released the cosmic dragon with this update. Still tweaking some things, adding new emp abilities etc. I'm getting different numbers. For example, 5/4/10/8 + 1/2/3/3 for GS will give 164670.4 MD = 21060 + 1638 + 4965 + 1.1 * (17522 + 13789 + 6323 + 13790 * 3 + 8190 + 5390 * 2) + 10056 + 13790 + 5390 and 2247.631 CD = 372 + 3.9 * 3 + 1.1 * (250.32 + 143.66 + 90.33 + 197 * 2 + 157 + 77 * 3) + 196.99 + 197 + 77. To explain in more detail, 21060 is the original MD with stellar gear, 1688 + 4965 is the additional MD from max level 3 crystal gear, 372 is the original CD with stellar gear, and 3.9 * 3 is the additional CD from max level 3 crystal gear. The rest of the values are from gems. Nonetheless, 5/4/10/8 + 1/2/3/3 is a good combination for GS since it ranks 28th on my list and would move up to rank 3 if the cosmic gems got a 10% bonus. I noticed that stellar gear may be responsible for decimal values in DMG and CD because it had around 13955.5 MH and 140.4 %MH. I haven't tested it much, and I only use the rounded values in my calculations. check trove.summerhaas and goto the PTS stellar &radiant gem tables, I see a few quoted numbers in your response that weren't on PTS. 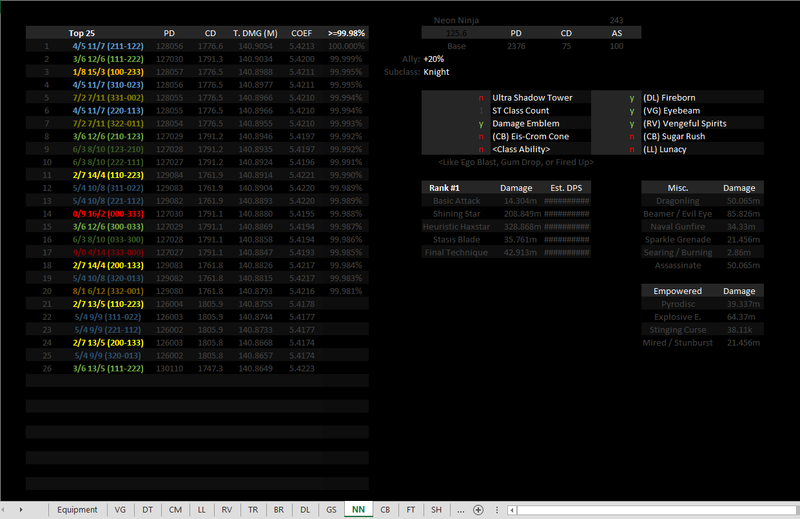 I am seeing some odd behavoir on my side, +3% cd dragon should give more than .2cd. My issue is related to an array formula issue which I'm looking into resolving. I have 164573MD under 5/4 10/8 1/2 3/3 on the large table but my matching array formula for the class page isn't matching them correctly yet. 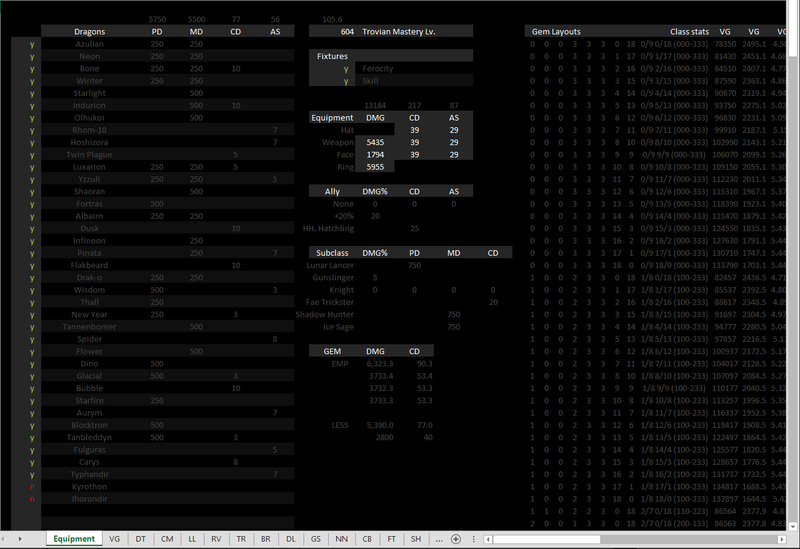 oh and I know the UI rounds, something like 7876 base md with +99.2%, says 15689 ingame. Ring might be fractional, calculated 85438.47 from 42891 base md, got 85439 in the UI, think the gun was fine. I knew pearls did fractional stuff to AS/MS too but their rounded values in the UI(s).